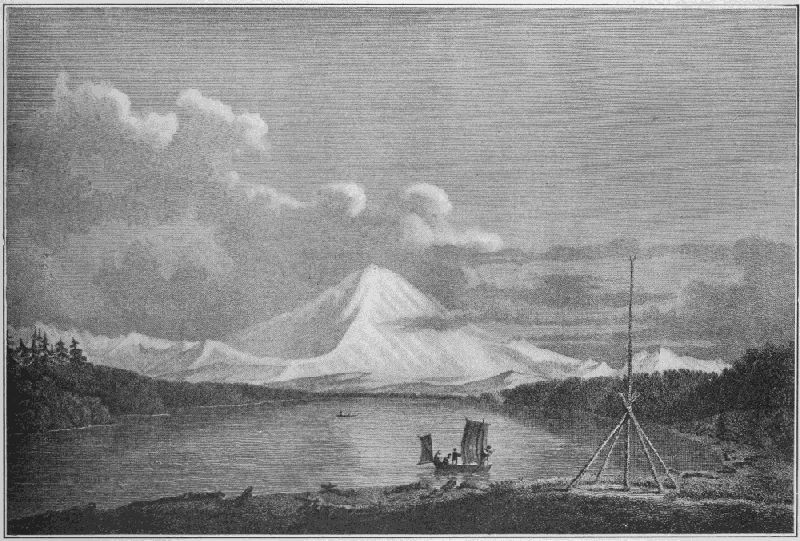 Here, for you to practice reading connected Chinuk Wawa speech, is a much fuller account of the 1870 expedition to climb Mt. Rainier that was mentioned in a post here last year. The book it comes from is Edmond Meany‘s compendium of Rainieriana, including passages from Theodore Winthrop‘s “The Canoe and the Saddle” that ought to be known to students of Chinook Wawa. First Picture of Mount Rainer. Drawn by W. Alexander from a sketch by J. Sykes, 1792. Engraved by J. Landseer for Vancouver’s Journal. Professor of History in the University of Washington. President of The Mountaineers. Author of “Vancouver’s Discovery of Puget Sound,” “History of the State of Washington,” etc. Set up and electrotyped. Published November, 1916. The beautiful Sluiskin Falls, at the head of Paradise Valley, have been admired by countless visitors to the Mount Rainier National Park. The name was bestowed upon them by Stevens and Van Trump after their return from what the Indian guide believed was sure death. Before they had left him at the camp near the falls and started to climb over the snow and ice, he delivered an eloquent plea in the Chinook jargon accompanied by natural but effective gestures. However, the Indian speech and the translation by General Stevens will likely be cherished as here reproduced. Kloshe nanich, mesika kloshe tilikum. Nika tikigh wawa kopa mesika. Mesika tikegh klatawa saghalie Takhoma, hyiu pelton. Halo tilikum mamook okoke pe mitlite. Hyas tyee mitlite kopa saghalie illahee kopa hyiu piah. Wake tikigh tilikum chako kopa yahka illahee. Ahnkuttie nika papa yahka papa, hyas skookum tyee kopa konaway Yakima tilikum, klatawa wake siah yahka la tet. Alta nanich piah chuck pe keekwulee tyee chako mimoluse yahka pe hyak klatawa keekwulee saghalie illahee, pe hyiu kloshe tumtum. Yahka wake mamook alta, halo ikt siwash mamook klatawa. Kloshe mesika klatawa, kloshe mamook. Hyiu snow, kloshe klatawa snow illahee, ahnkuttie nika mimoluse Takhoma mowich kloshe ooakut. Alta mesika nanich klatawa hyiu stone, wake kloshe klatawa pe mesika teahwit tseepie alta mesika klatawa keekwulee pe mimoluse, keekwulee pe mimoluse. Mesika klatawa hyas mesachie snow pe keekwulee hyas mesachie illahee yahka Takhoma mowich halo klatawa. Mesika klatawa hyas saghalie illahee hyiu stone chako, hyiu stone chako, pe mesika mimoluse pe kokshut mesika. Spose mesika klatawa kopa okoke saghalie illahee alta mesika hyiu skookum pe cole wind alta yahka mahsh mesika kopa keekwulee illahee pe mimoluse mesika. Spose mesika mitlite mesachie iktas hyas keekwulee tyee mitlite Takhoma mesika mimoluse pe mesika mahsh okoke piah chuck. Mesika mamook nika tumtum kwass, spose mesika klatawa Takhoma saghalie. Mesika mimoluse mesika spose klatawa Takhoma. Mesika mimoluse pe mesika tilikum sollecks kopa nika. Spose mesika klatawa, nika mitlite mokst sun pe alta nika klatawa kopa Olympia pe wawa kopa mesika tilikum alta mesika mimoluse siah saghalie Takhoma. Mesika potlatch pehpah kopa nika mamook kumtuks mesika mimoluse wake nika mesachie. Listen to me, my good friends. I must talk to you. Your plan to climb Takhoma is all foolishness. No one can do it and live. A mighty chief dwells upon the summit in a lake of fire. He brooks no intruders. 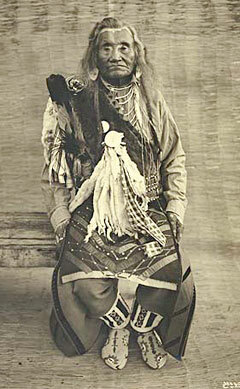 Many years ago my grandfather, the greatest and bravest chief of all the Yakima, climbed nearly to the summit. There he caught sight of the fiery lake and the infernal demon coming to destroy him, and he fled down the mountain, glad to escape with his life. Where he failed, no other Indian ever dared make the attempt. At first the way is easy, the task seems light. The broad snowfields, over which I have often hunted the mountain goat, offer an inviting path. But above them you will have to climb over steep rocks overhanging deep gorges where a misstep would hurl you far down—down to certain death. You must creep over steep snow banks and cross deep crevasses where a mountain goat could hardly keep his footing. You must climb along steep cliffs where rocks are continually falling to crush you, or knock you off into the bottomless depths. And if you should escape these perils and reach the great snowy dome, then a bitterly cold and furious tempest will sweep you off into space like a withered leaf. But if by some miracle you should survive all these perils the mighty demon of Takhoma will surely kill you and throw you into the fiery lake. You make my heart sick when you talk of climbing Takhoma. You will perish if you try to climb Takhoma. You will perish and your people will blame me. If you will go, I will wait here two days, and then go to Olympia and tell your people that you perished on Takhoma. Give me a paper to them to let them know that I am not to blame for your death. The following day Longmire and the writer went down the canyon to its junction with the Cowlitz River, in search of a band of Indians who usually made their headquarters at this point, and among whom Longmire hoped to find some hunter familiar with the mountains who might guide us to the base of Takhoma. The tiny rivulet as we descended soon swelled to a large and furious torrent, and its bed filled nearly the whole bottom of the gorge. The mountains rose on both sides precipitously, and the traces of land-slides which had gouged vast furrows down their sides were frequent. With extreme toil and difficulty we made our way, continually wading the torrent, clambering over broken masses of rock which filled its bed, or clinging to the steep hillsides, and reached the Cowlitz at length after twelve miles of this fatiguing work, but only to find the Indian camp deserted. Further search, however, was rewarded by the discovery of a rude shelter formed of a few skins thrown over a framework of poles, beneath which sat a squaw at work upon a half-dressed deerskin. An infant and a naked child of perhaps four years lay on the ground near the fire in front. Beside the lodge and quietly watching our approach, of which he alone seemed aware, stood a tall, slender Indian clad in buckskin shirt and leggings, with a striped woolen breech-clout, and a singular head garniture which gave him a fierce and martial appearance. This consisted of an old military cap, the visor thickly studded with brassheaded nails, while a large circular brass article, which might have been the top of an oil-lamp, was fastened upon the crown. Several eagle feathers stuck in the crown and strips of fur sewed upon the sides completed the edifice, which, notwithstanding its components, appeared imposing rather than ridiculous. A long Hudson Bay gun, the stock also ornamented with brass-headed tacks, lay in the hollow of the Indian’s shoulder. He received us with great friendliness, yet not without dignity, shaking hands and motioning us to a seat beneath the rude shelter, while his squaw hastened to place before us suspicious-looking cakes of dried berries, apparently their only food. After a moderate indulgence in this delicacy, Longmire made known our wants. The Indian spoke fluently the Chinook jargon, that high-bred [hybrid; compare how many folks pronounce it nowadays–DDR]lingo invented by the old fur-traders. He called himself “Sluiskin,” and readily agreed to guide us to Rainier, known to him only as Takhoma, and promised to report at Bear Prairie the next day. It was after seven in the evening when we reached camp, thoroughly fagged. Punctual to promise, Sluiskin rode up at noon mounted upon a stunted Indian pony, while his squaw and pappooses followed upon another even more puny and forlorn. After devouring an enormous dinner, evidently compensating for the rigors of a long fast, in reply to our inquiries he described the route he proposed to take to Takhoma. Pointing to the almost perpendicular height immediately back or east of our camp, towering three thousand feet or more overhead, the loftiest mountain in sight, “We go to the top of that mountain to-day,” said he, “and to-morrow we follow along the high, backbone ridge of the mountains, now up, now down, first on one side and then on the other, a long day’s journey, and at last, descending far down from the mountains into a deep valley, reach the base of Takhoma.” Sluiskin illustrated his Chinook with speaking signs and pantomime. He had frequently hunted the mountain sheep upon the snow-fields of Takhoma, but had never ascended to the summit. It was impossible to do so, and he put aside as idle talk our expressed intention of making the ascent. We had already selected the indispensable articles for a week’s tramp, a blanket apiece, the smallest coffee-pot and frying-pan, a scanty supply of bacon, flour, coffee, etc., and had made them up into suitable packs of forty pounds each, provided with slings like a knapsack, and had piled together under the lee of a huge fallen trunk our remaining goods. Longmire, who although impatient to return home, where his presence was urgently needed, had watched and directed our preparations during the forenoon with kindly solicitude, now bade us good-by: mounted on one mule and leading the other, he soon disappeared down the trail on his lonely, homeward way. He left us the little pack-horse, thinking it would be quite capable of carrying our diminished outfit after our return from Takhoma. Sluiskin led the way. The load upon his shoulders was sustained by a broad band, passing over his head, upon which his heavy, brass-studded rifle, clasped in both hands, was poised and balanced. Leaving behind the last vestige of trail, we toiled in single file slowly and laboriously up the mountain all the afternoon. The steepness of the ascent in many places required the use of both hand and foot in climbing, and the exercise of great caution to keep the heavy packs from dragging us over backwards. Coleman lagged behind from the start, and at intervals his voice could be heard hallooing and calling upon us to wait. Towards sunset we reached a level terrace, or bench, near the summit, gladly threw off our packs, and waited for Coleman [“Mr. Edward T. Coleman, an English gentleman of Victoria, a landscape artist and an Alpine tourist, whose reputed experience in Switzerland had raised a high opinion of his ability above the snow-line”–p. 96 — DDR], who, we supposed, could not be far below. He not appearing, we hallooed again and again. No answer! We then sent Sluiskin down the mountain to his aid. After an hour’s absence the Indian returned. He had descended, he said, a long distance, and at last caught sight of Coleman. He was near the foot of the mountain, had thrown away his pack, blankets and all, and was evidently returning to camp. And Sluiskin finished his account with expressions of contempt for the “cultus King George man.” What was to be done? Coleman carried in his pack all our bacon, our only supply of meat, except a few pounds of dried beef. He also had the barometer, the only instrument that had survived the jolts and tumbles of our rough trip. But, on the other hand, he had been a clog upon our march from the outset. He was evidently too infirm to endure the toil before us, and would not only be unable to reach, still less ascend Takhoma, but might even impede and frustrate our own efforts. Knowing that he would be safe in camp until our return, we hastily concluded to proceed without him, trusting to our rifles for a supply of meat. Sluiskin led us along the side of the ridge in a southerly direction for two miles farther, to a well-sheltered, grassy hollow in the mountain-top, where he had often previously encamped. It was after dark when we reached this place. The usual spring had gone dry, and, parched with thirst we searched the gulches of the mountain-side for water an hour, but without success. At length the writer, recalling a scanty rill which trickled across their path a mile back, taking the coffee-pot and large canteen, retraced his steps, succeeded in filling these utensils after much fumbling in the dark and consequent delay, and returned to camp. He found Van Trump and the Indian, anxious at the long delay, mounted on the crest of the ridge some two hundred yards from camp, waving torches and shouting lustily to direct his steps. The mosquitoes and flies came in clouds, and were terribly annoying. After supper of coffee and bread, we drank up the water, rolled ourselves in our blankets, and lay down under a tree with our flags floating from under the boughs overhead. Hot as had been the day, the night was cold and frosty, owing, doubtless, to the altitude of our camp. At the earliest dawn next morning we were moving on without breakfast, and parched with thirst. Sluiskin led us in a general course about north-northeast, but twisting to nearly every point of the compass, and climbing up and down thousands of feet from mountain to mountain, yet keeping on the highest backbone between the headwaters of the Nisqually and Cowlitz rivers. After several hours of this work we came to a well-sheltered hollow, one side filled with a broad bed of snow, at the foot of which nestled a tiny, tranquil lakelet, and gladly threw off our heavy packs, assuaged our thirst, and took breakfast,—bread and coffee again. Early as it was, the chill of the frosty night still in the air, the mosquitoes renewed their attacks, and proved as innumerable and vexatious as ever. Continuing our march, we crossed many beds of snow, and drank again and again from the icy rills which flowed out of them. The mountains were covered with stunted mountain-ash and low, stubby firs with short, bushy branches, and occasionally a few pines. Many slopes were destitute of trees but covered with luxuriant grass and the greatest profusion of beautiful flowers of vivid hues. This was especially the case with the southern slopes, while the northern sides of the mountains were generally wooded. We repeatedly ate berries, and an hour afterwards ascended to where berries of the same kind were found scarcely yet formed. The country was much obscured with smoke from heavy fires which had been raging on the Cowlitz the last two days. But when at length, after climbing for hours an almost perpendicular peak,—creeping on hands and knees over loose rocks, and clinging to scanty tufts of grass where a single slip would have sent us rolling a thousand feet down to destruction,—we reached the highest crest and looked over, we exclaimed that we were already well repaid for all our toil. Nothing can convey an idea of the grandeur and ruggedness of the mountains. Directly in front, and apparently not over two miles distant, although really twenty, old Takhoma loomed up more gigantic than ever. We were far above the level of the lower snow-line on Takhoma. The high peak upon which we clung seemed the central core or focus of all the mountains around, and on every side we looked down vertically thousands of feet, deep down into vast, terrible defiles, black and fir-clothed, which stretched away until lost in the distance and smoke. Between them, separating one from another, the mountain-walls rose precipitously and terminated in bare, columnar peaks of black basaltic or volcanic rock, as sharp as needles. It seemed incredible that any human foot could have followed out the course we came, as we looked back upon it. After a few hours more of this climbing, we stood upon the summit of the last mountain-ridge that separated us from Takhoma. We were in a saddle of the ridge; a lofty peak rose on either side. Below us extended a long, steep hollow or gulch filled with snow, the farther extremity of which seemed to drop off perpendicularly into a deep valley or basin. Across this valley, directly in front, filling up the whole horizon and view with an indescribable aspect of magnitude and grandeur, stood the old leviathan of mountains. The broad, snowy dome rose far among and above the clouds. The sides fell off in vertical steeps and fearful black walls of rock for a third of its altitude; lower down, vast, broad, gently sloping snow-fields surrounded the mountain, and were broken here and there by ledges or masses of the dark basaltic rock protruding above them. Long, green ridges projected from this snow-belt at intervals, radiating from the mountain and extending many miles until lost in the distant forests. Deep valleys lay between these ridges. Each at its upper end formed the bed of a glacier, which closed and filled it up with solid ice. Below the snow-line bright green grass with countless flowers, whose vivid scarlet, blue, and purple formed bodies of color in the distance, clothed the whole region of ridges and valleys, for a breadth of five miles. The beautiful balsam firs, about thirty feet in height, and of a purple, dark-green color, stood scattered over the landscape, now singly, now in groves, and now in long lines, as though planted in some well-kept park. Farther down an unbroken fir forest surrounded the mountain and clad the lower portions of the ridges and valleys. In every sheltered depression or hollow lay beds of snow with tiny brooks and rivulets flowing from them. The glaciers terminated not gradually, but abruptly, with a wall of ice from one to five hundred feet high, from beneath which yeasty torrents burst forth and rushed roaring and tumbling down the valleys. The principal of these, far away on our left front, could be seen plunging over two considerable falls, half hidden in the forest, while the roar of waters was distinctly audible. At length we cautiously descended the snow-bed, and, climbing at least fifteen hundred feet down a steep but ancient land-slide by means of the bushes growing among the loose rocks, reached the valley, and encountered a beautiful, peaceful, limpid creek. Van Trump could not resist the temptation of unpacking his bundle, selecting one of his carefully preserved flies, and trying the stream for trout, but without a single rise. After an hour’s rest and a hearty repast we resumed our packs, despite Sluiskin’s protests, who seemed tired out with his arduous day’s toil and pleaded hard against traveling farther. Crossing the stream, we walked through several grassy glades, or meadows, alternating with open woods. We soon came to the foot of one of the long ridges already described, and ascending it followed it for several miles through open woods, until we emerged upon the enchanting emerald and flowery meads which clothe these upper regions. Halting upon a rising eminence in our course, and looking back, we beheld the ridge of mountains we had just descended stretching from east to west in a steep, rocky wall; a little to the left, a beautiful lake, evidently the source of the stream just crossed, which we called Clear Creek, and glimpses of which could be seen among the trees as it flowed away to the right, down a rapidly descending valley along the foot of the lofty mountain-wall. Beyond the lake again, still farther to the left, the land also subsided quickly. It was at once evident that the lake was upon a summit, or divide, between the waters of the Nisqually and Cowlitz rivers. The ridge which we were ascending lay north and south, and led directly up to the mountain. We camped, as the twilight fell upon us, in an aromatic grove of balsam firs. A grouse, the fruit of Sluiskin’s rifle, broiled before the fire, and impartially divided gave a relish to the dry bread and coffee. After supper we reclined upon our blankets in front of the bright, blazing fire, well satisfied. The Indian, when starting from Bear Prairie, had evidently deemed our intention of ascending Takhoma too absurd to deserve notice. The turning back of Mr. Coleman only deepened his contempt for our prowess. But his views had undergone a change with the day’s march. The affair began to look serious to him, and now in Chinook, interspersed with a few words of broken English and many signs and gesticulations, he began a solemn exhortation and warning against our rash project. Takhoma, he said, was an enchanted mountain, inhabited by an evil spirit, who dwelt in a fiery lake on its summit. No human being could ascend it or even attempt its ascent, and survive. At first, indeed, the way was easy. The broad snow-fields, over which he had so often hunted the mountain goat, interposed no obstacle, but above them the rash adventurer would be compelled to climb up steeps of loose, rolling rocks, which would turn beneath his feet and cast him head-long into the deep abyss below. The upper snow-slopes, too, were so steep that not even a goat, far less a man, could get over them. And he would have to pass below lofty walls and precipices whence avalanches of snow and vast masses of rocks were continually falling; and these would inevitably bury the intruder beneath their ruins. Moreover, a furious tempest continually swept the crown of the mountain, and the luckless adventurer, even if he wonderfully escaped the perils below, would be torn from the mountain and whirled through the air by this fearful blast. And the awful being upon the summit, who would surely punish the sacrilegious attempt to invade his sanctuary,—who could hope to escape his vengeance? Many years ago, he continued, his grandfather, a great chief and warrior, and a mighty hunter, had ascended part way up the mountain, and had encountered some of these dangers, but he fortunately turned back in time to escape destruction; and no other Indian had ever gone so far. Finding that his words did not produce the desired effect, he assured us that, if we persisted in attempting the ascent, he would wait three days for our return, and would then proceed to Olympia and inform our friends of our death; and he begged us to give him a paper (a written note) [typical Chinook Jargon phrasing–DDR] to take to them, so that they might believe his story. Sluiskin’s manner during this harangue was earnest in the extreme, and he was undoubtedly sincere in his forebodings. After we had retired to rest, he kept up a most dismal chant, or dirge, until late in the night. The dim, white, spectral mass towering so near, the roar of the torrents below us, and the occasional thunder of avalanches, several of which fell during the night, added to the weird effect of Sluiskin’s song. We sent the horses back by the Indian to Bear Prairie for grass, there being no indications of the rain ceasing. The storm indeed lasted three days, during which we remained sheltered beneath the gum-sheet as far as possible, and endeavored to counteract the rain by heaping up our fire in front. About eight o’clock on the second morning, Sluiskin reported himself with our horse, which he returned, he said, because he was about to return to his lodge on the Cowlitz, being destitute  of shelter and food for his family on Bear Prairie. He vigorously replenished the fire, declined breakfast, jeered Coleman for turning back, although probably the latter did not comprehend his broken lingo, and departed. Sluiskin was an original and striking character. Leading a solitary life of hardships amidst these wilds, yet of unusual native intelligence, he had contrived, during rare visits to the settlements, to acquire the Chinook jargon, besides a considerable stock of English words, while his fund of general information was really wonderful. He was possessed of a shrewd, sarcastic wit, and, making no pretense to the traditional gravity of his race, did not scruple to use it freely. Yet beneath this he cherished a high sense of pride and personal independence. Although of the blood of the numerous and powerful Yakimas, who occupied the country just east of the Cascades, he disdained to render allegiance to them or any tribe, and undoubtedly regarded the superintendent of Indian affairs, or even the great father at Washington himself, with equally contemptuous indifference. As the last rays of the sun, one warm, drowsy summer afternoon, were falling aslant the shady streets of Olympia, Mr. Longmire’s well-worn family carry-all, drawn by two fat, grass-fed horses, came rattling down the main street at a most unusual pace for them; two bright flags attached to Alpine staffs, one projecting from each door, fluttered gayly overhead, while the occupants of the carriage looked eagerly forth to catch the first glimpse of welcoming friends. We returned after our tramp of two hundred and forty miles with visages tanned and sun-scorched, and with forms as lean and gaunt as greyhounds, and were received and lionized to the full, like veterans returning from an arduous and glorious campaign. For days afterward, in walking along the smooth and level pavements, we felt a strong impulse to step high, as though still striding over the  innumerable fallen logs and boughs of the forest, and for weeks our appetites were a source of astonishment to our friends and somewhat mortifying to ourselves. More than two months had elapsed before Mr. Van Trump fully recovered from his hurts. We published at the time short newspaper accounts of the ascent, and, although an occasional old Puget Sounder will still growl, “They say they went on top of Mount Rainier, but I’d like to see them prove it,” we were justly regarded as the first, and as I believe the only ones up to the present time, who have ever achieved the summit of Takhoma. ← LINGUISTIC ARCHAEOLOGY REVEALS FUR-TRADE PATTERNS!!! !